In this P90X2 review, it’s all about CORE ENGAGEMENT. That’s not the name of the workout, but X2 Balance + Power is a monster workout for your core. You have some core exercises, meant to target your core, but then… add in many, many additional moves that are designed in such a way that you must engage your core, to maintain your balance and perform the move correctly. Tony Horton states very early in the workout, FORM IS KING. With that being said, I encourage everyone to maintain form first, then go for reps. Maintain form first, then add weight. If that’s somewhat confusing, let me rephrase a bit. You’ll perform some exercises, where Tony says, 16 reps. There were some moves, that my form started to suffer, but I was not yet at 16 reps. I decided that since form is king…. I did as many as I could with good form, then I used my P90X2 Worksheets, and wrote down my number. Next time, I will try to improve. Now there were also some exercises, that Tony suggested adding weight. I did everything, with a light weight. Some of the moves, I opted to not use weight. I wanted to see what I was capable of with proper form first, then I made my notes on the worksheets, and next time I will add weight as needed. Quick note: Jump over and check out my page for the P90X2 Worksheets. As I see things that will improve the worksheets, I edit, upload, and make the improved worksheets available to you. I also added a place on the worksheets to add heart rate information, in case you are a HR kinda guy/gal like me. 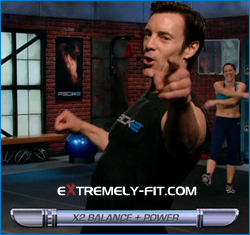 Now back to the P90X2 Review for X2 Balance + Power. 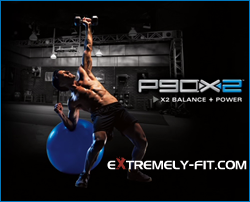 P90X2 Review – X2 Balance + Power. It Felt Like X2 Core + Balance + Some Power. Let Me Explain. Total calories burned: 674. Max heart rate 170. Average heart rate 131. I’m pretty thrilled with that number of calories burned. The P90X2 Nutrition Guide states that a good average calorie burn for P90X2 workouts is 650. Pretty close to what I have seen so far on X2 Core, Plyocide, and now Balance + Power. However, X2 Total Body was 800! I’m sure that this number will be higher on other workouts too. That’s why I love heart rate monitors. This workout is approximately 62 minutes in length. The warmup and foam rolling will sound very familiar if you have read my other P90X2 reviews. If you have, jump down to the workout. Nothing new. Except a couple of warmup moves with light weights during the warm-up. The warm up starts using a balance ball or towel. 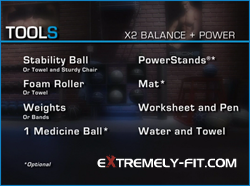 I must admit, I love the addition of the balance ball in P90X2. The warm-up moves are called: Twist, Squat, Side Stretch, Alt Back Lunge, and Atlas. Warm up is approximately 4 minutes. Still part of the warm up, foam rolling. Foam rolling is way too short. I know you may be pressed for time, and I’m no exception, so I don’t get the luxury of pressing pause and adding in more time. Instead, I’m going to add in foam rolling later in the day. Maybe while watching TV with the family or something like that. Get a foam roller! You have modifications though if you don’t have one, and they are demonstrated on the DVD. You’ll spend an additional 3 minutes on foam rolling. Moving straight into more warm-up moves, such as: Roller Angel, Roller Sphinx, World’s Greatest Stretch, Inch Worm, Scorpion, and Groiners. A couple of new moves…. Dumbell Squat Press and Mountain Climber. This takes another 7-8 minutes, approximately. Now you get a water break for about 1 minute. The cool down and stretch is 9 minutes. I’m becoming a big fan of the cool down! lol. As a matter of fact, with the addition of foam rolling in P90X2, I’m starting to really see that I have some unresolved trouble areas. My goal throughout P90X2, will be to see those trouble areas improve, if not get entirely resolved. I’m sure it’s an accumulation of extreme training since I started my first round of the P90X Workout in 2007. Throw in Insanity, and Insanity Asylum a few times and you have a body that needs some recovery! Can you travel with this P90X2 workout? Yes. This workout can be done while traveling. Every video I have seen so far has a person modifying for the purpose of having access to limited equipment. I have to admit, while I have not been modifying, the moves don’t look easy by any means. I’m sure at some point I will travel, and I’m glad to see P90X2 can come with me! Let me sum up the necessary P90X2 Equipment Needed. More = Better. If your traveling, you have to make the adjustments as needed. You definitely need weights or bands, so if your traveling, get some resistance bands. If you can’t get a stability ball and foam roller, you have the towel option. You can get by without the others if you must. I have been able to accumulate them all over the years, but if you can invest in this equipment, you’ll appreciate the investment. Think about Shakeology, I love this stuff, and it get’s me all the nutrition I need, that I simply do not get in daily meals. It’s impossible. So Shakeology is P90X2 for the inside. It’s an investment in your health, which you can never replace once it’s gone. So while you have it, take care of it! 30 meals per bag, 30 meal replacements. When you look at it from that perspective, it’s well worth it. The healthiest thing you will ever put in your body! I had mine just now while writing this P90X2 Review. Speaking of reviews, I hope you enjoyed this one, I love sharing my experiences, and I love hearing feedback from you all. So comment below, put in your two cents for the readers that follow after you. Share the good word of health and fitness, what you think about the workouts, and your success! It will encourage and support others. Take a moment to comment. I’d also appreciate if you shared this on Facebook, or used the share options below. Visit our store the very next time you have a need for Beachbody products or supplements. We are an authorized distributor, and appreciate your business! Good luck with P90X2! If you want to read another P90X2 Review, you can find them all by clicking here. Robert, excellent review as always. Looks like a terrific workout. Keep digging deep!